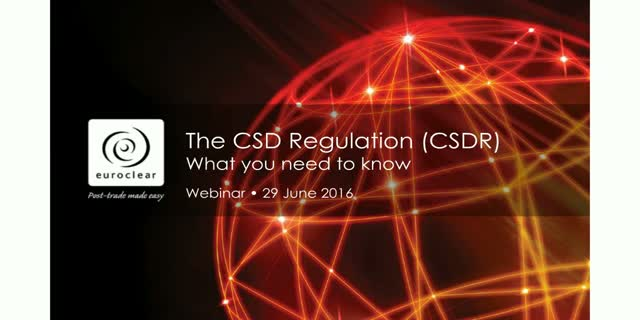 Key elements of the CSD Regulation are set to come into force this year, with important implications for all market participants. To better serve your needs, Euroclear client services are moving towards a more collaborative approach using Taskize. In this short webinar, you’ll hear more about our vision, what the benefits of Taskize are for you, and how you can be part of this fast-growing network! Find out more on Euroclear's new international settlement link to Peru and how this will provide the same ease of access and degree of asset protection expected by international investors in any well-established market. Euroclear y el Depósito Central de Valores (DCV-Chile), explicarán las actuales condiciones de operación del link que mantienen vigente, con especial foco en lo relativo a las operaciones sobre bonos soberanos chilenos, en consideración a los cambios regulatorios ocurridos en Chile. On Monday, 5 December, Euroclear Bank Settlement went live on the Taskize platform. Taskize is a new service that will help the financial services industry make work flow by enabling clients, colleagues and counterparties to address manual interventions efficiently, intelligently and securely. In this 30-minute webinar, Luigi Bearzatto, Euroclear, joins Taskize Limited's John O'Hara and Philip Slavin to provide more detail on Taskize, its features, and the Euroclear-related offer that can be made available to you. Russia’s new corporate actions environment is due to go live on 1 July 2016. Now international investors will experience an automated and centralised process through the securities depositories in alignment with international best practise. These days, no meaningful conversation on financial services innovation can be had without a mention of blockchain. It is believed by many to have the potential to address many limitations of current financial services processes and infrastructure by providing an irrevocable record of identity and provenance, and reconciling events so that there is a single version of truth. But with potential and interest also comes hype and confusion. In this webinar, industry experts will cut through the hype and separate myth from reality. They will explore characteristics of blockchain technology that make it suitable for financial services applications, and what current industry issues can really be solved by distributed ledger technology. Connecting global investment funds participants, providing tailored solutions to international and domestic markets, both trade and post trade. Tailor our solution to fit your specific needs.